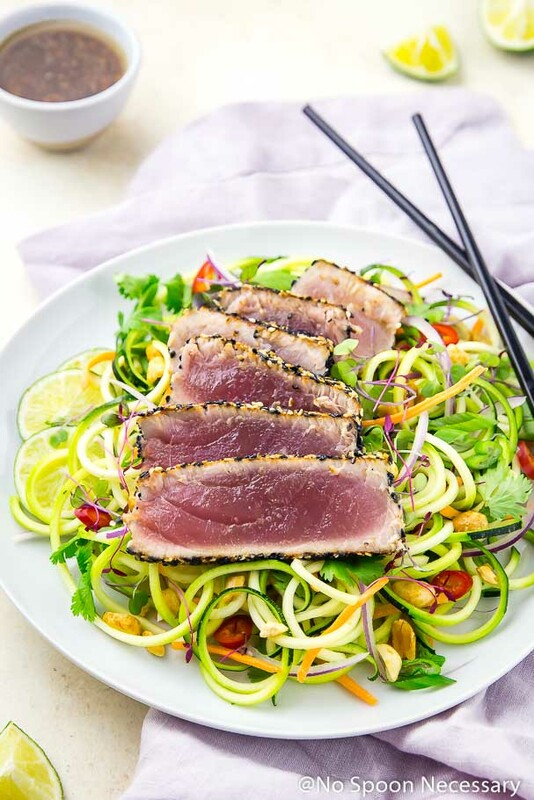 Piquant, sesame crusted, pan seared Ahi tuna served over a bed of crisp zucchini noodles loaded with fresh veggies, bright herbs, and finished with a smooth Asian flavored dressing. 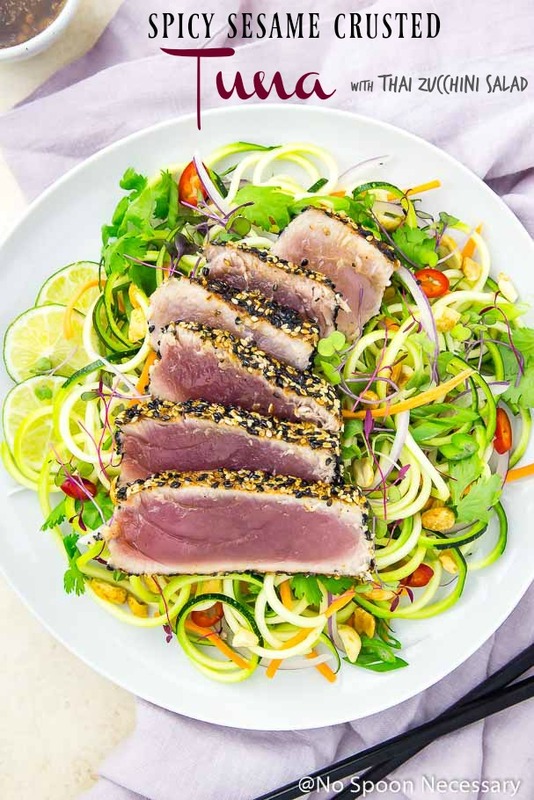 Ready, from prep to finish, in 20 minutes or less, this Spicy Sesame Crusted Seared Tuna Zucchini Salad is perfect for lunch, dinner or summer entertaining! ⬆️ I Said that in my very best Mrs. Doubtfire voice. You can hear it right? In case you have zero clue what I’m talking about peep THIS. Anywho, before we get to today’s recipe I wanted to clear something up really quickly since there seems to be some confusion concerning my last two posts. If you are a dedicated, loyal follower of NSN (Hey there! I  you! ), then you might remember me saying a week ago we moved. And then you may remember on Thursday I updated an old post. And that post ALSO happened to say we moved. Well, I kept the actual WRITTEN words in that updated post on Thursday the same. Meaning, those words were written TWO years ago. And it just so happens that 2 years ago we also moved! Crazy coincidence, right? I didn’t mean to cause pandemonium in the streets and mass confusion on the interwebs! TWO YEARS AGO – Boy and I moved to NC. Feel free to leave a comment below if you need extra special attention and clarification. Whew. Now that we have THAT cleared up, let’s eat. I’m famished. 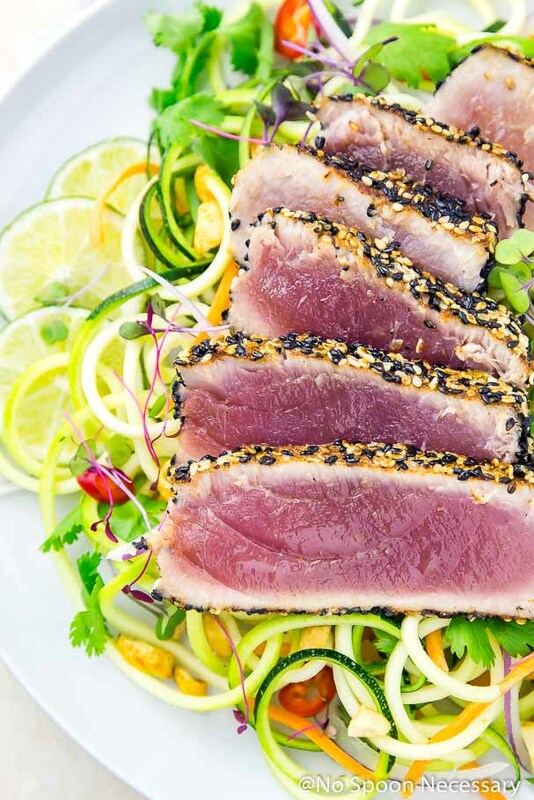 Thinly sliced, pan seared, luscious, mild tuna coated with a piquant, fragrant mix of seasonings and sesame seeds. 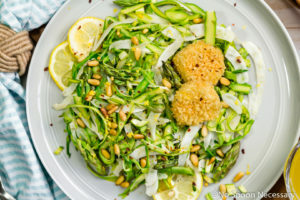 Lovingly arranged and served over an abundance of delicate, crisp zucchini noodles loaded with fresh veggies, bright herbs, spicy sliced chiles and crunchy peanuts. 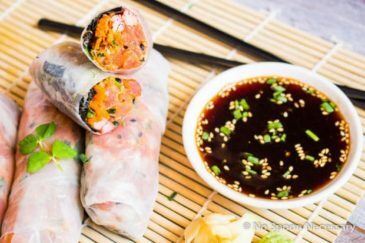 Finished with a generous drizzle of a light, silky, smooth Asian flavored dressing. This salad is fresh and healthy, yet jam packed flavor AND healthy noms. (READ: it’s fantastically figure friendly. Because, hello beach body goals, I’m still looking at you). PLUS it is suuuuper simple and fast to throw together (25 minutes or less). AAAAND, it is also elegant enough for entertaining (I mean, just LOOK at all the fresh and fabulous colors). 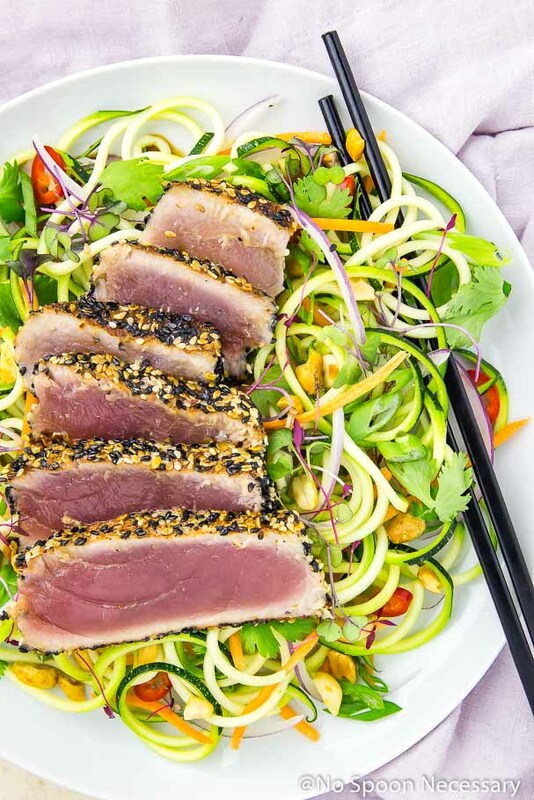 Essentially, this Spicy Sesame Crusted Seared Tuna Zucchini Salad is straight  and BEGGING to be devoured. 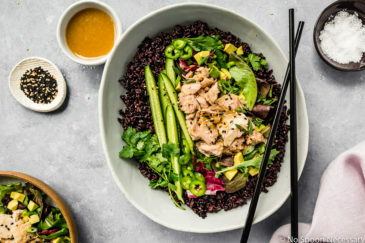 When consuming raw (or quickly seared) fish, it is VERY important to purchase your fish from a trusted, reputable source. Make sure you are buying fish that is safe for raw consumption and has been handled/stored properly. If you like your tuna quickly seared and rare, I recommend cooking the tuna for about 1 minute per side. 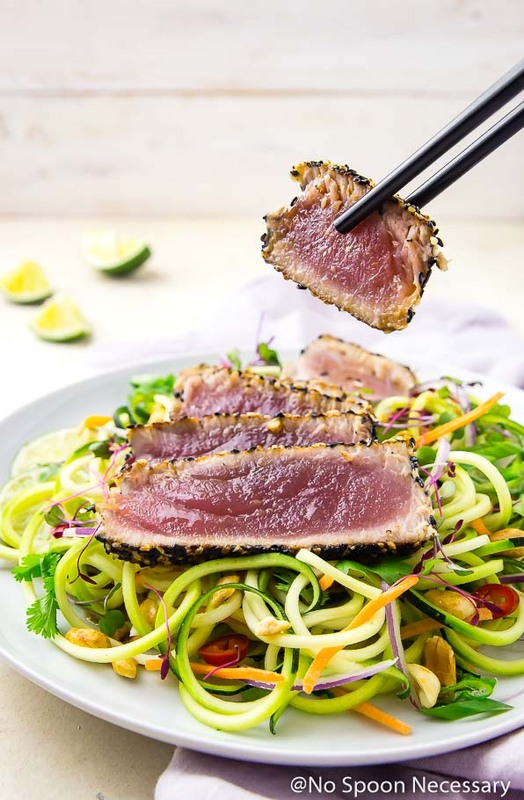 If you like your tuna medium-rare, bump the cooking time up to about 2 – 2 ½ minutes per side. I used a mixture of both black and white sesame seeds to encrust my tuna. You can use just black or white, or a mixture of both. The dressing can be made up to 3 days in advance and stored in a tight sealed container, or jar, in the refrigerator. Make sure you vigorously shake or whisk the dressing before serving. 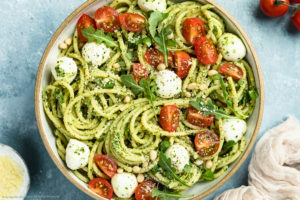 If you aren’t a fan of raw zucchini noodles, you can quickly sauté them as indicated in step 4 of the recipe. Make sure you cook the “noodles” until JUST cooked through and al dente. Also, do NOT season the zucchini noodles in advance of cooking or they will get watery! 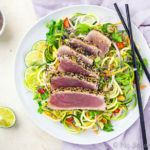 Quick, easy, healthy AND delicious, this Spicy Sesame Crusted Seared Tuna Zucchini Salad is perfect for lunch, dinner and entertaining. Print the recipe and get this in your life. Pronto. I pinkie-promise you are going to love it! 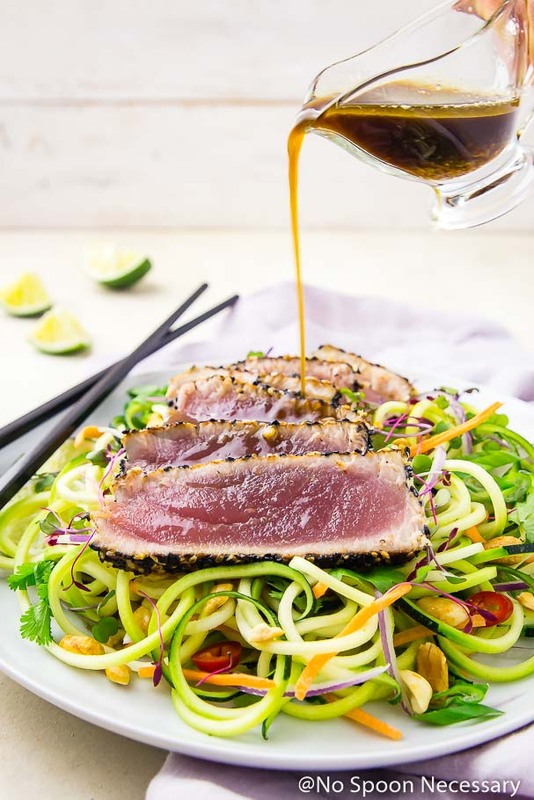 Piquant, sesame crusted ahi tuna served over a bed of crisp zucchini noodles loaded with fresh veggies, bright herbs, and finished with a smooth Asian flavored dressing. 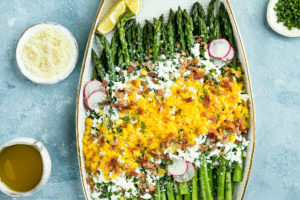 Ready, from prep to finish, in 20 minutes or less, this salad is perfect for lunch, dinner or entertaining! Make the Dressing: In a small bowl whisk together all the ingredients for the dressing. Taste and adjust for seasoning with salt and pepper. Set aside. For the Tuna: Season the tuna steak on all sides with chili powder, coriander, ginger, salt and pepper. Place the sesame seeds on a plate and add the tuna, gently pressing to adhere the seeds and turning to fully coat. Heat a good drizzle both olive and sesame oil in a medium sauté pan over medium-high heat. Add the tuna and sear, about 30 seconds – 1 minute on each side depending on how cooked through you would like it. (The white sesame seeds should be slightly golden, but the inside of the tuna should be rare.) Transfer the tuna to a clean cutting board and let rest for a minute. 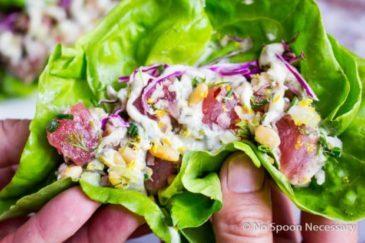 Cut the tuna into ¼’’ thick slices. Optional: Return the sauté pan to the stove. Add the zucchini noodles and season liberally with salt and pepper. Cook for 3 minutes, or until warmed and al dente. Remove to bowl. To serve: Add zucchini noodles, carrot, onion, greens, cilantro, scallions and Thai chile to a bowl. Drizzle with half of the dressing and toss to combine. Arrange salad on plates and top with sliced tuna. Sprinkle with peanuts and serve with remaining dressing on the side. Enjoy! 1. 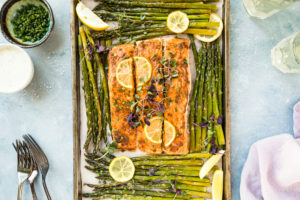 When consuming raw (or quickly seared) fish, it is VERY important to purchase your fish from a trusted, reputable source. Make sure you are buying fish that is safe for raw consumption and has been handled/stored properly. 2. If you like your tuna quickly seared and rare, I recommend cooking the tuna for about 1 minute per side. 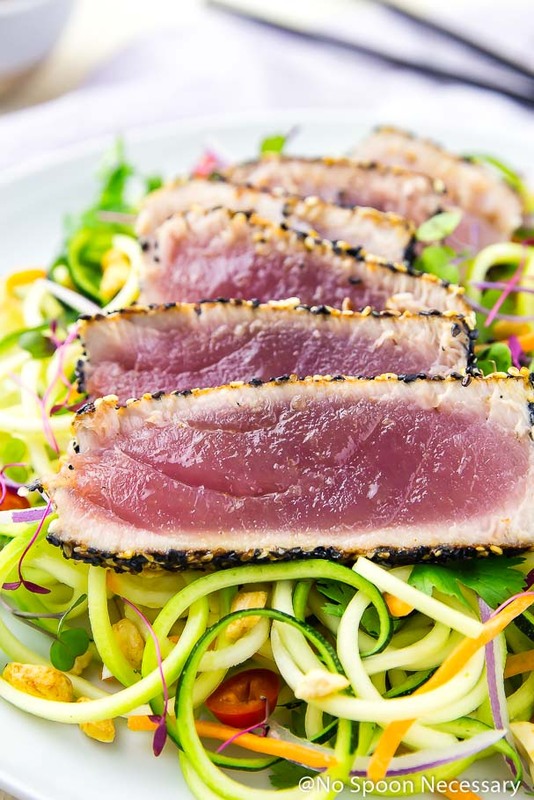 If you like your tuna medium-rare, bump the cooking time up to about 2 – 2 ½ minutes per side. 3. I used a mixture of both black and white sesame seeds to encrust my tuna. You can use just black or white, or a mixture of both. 4. 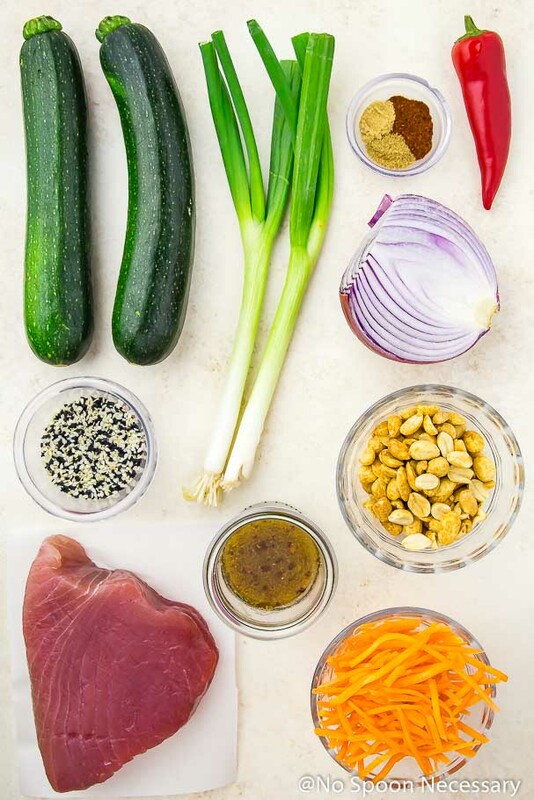 The dressing can be made up to 3 days in advance, and stored in a tight sealed container or jar in the refrigerator. Make sure you vigorously shake or whisk the dressing before serving. 5. If you aren’t a fan of raw zucchini noodles, you can quickly sauté them as indicated in step 4 of the recipe. Make sure you cook the "noodles" until JUST cooked through and al dente. Also, do NOT season the zucchini noodles in advance of cooking or they will get watery! 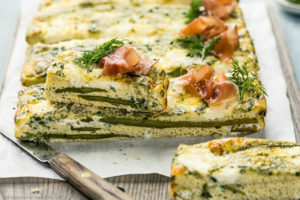 My goodness, this recipe looks mouthwatering! I LOVE crusted tuna! Great job on this post! I have a confession. I hate cooked zucchini, it leaves a weird aftertaste in my mouth which is always impossible to get rid of. But raw zucchini totally floats my boat, and I have yet to meet a piece of seared tuna that I don’t enjoy. Loving the addition of peanuts and peppers. LOL, I can totally hear the Mr.s Doubtfire voice. 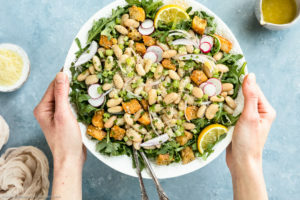 This salad looks like the perfect summer dish – refreshing yet flavorful and with enough protein to keep you going. Love it. I have a tendency to move every year and a half so I’m kind of jealous that you’re now settled into your forever home. 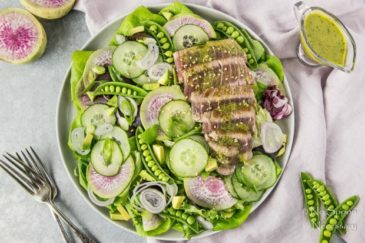 Also, this seared tuna salad looks incredible! Perfect for summer.